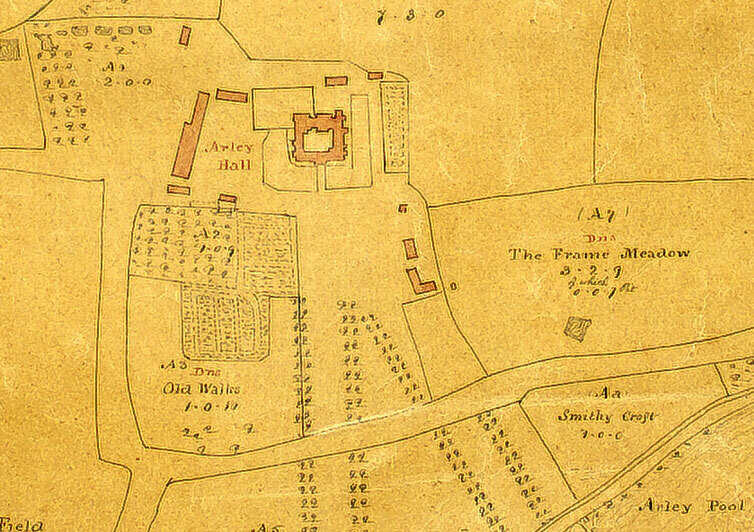 This map extract shows the area around Arley Hall when Sir Peter Warburton (4th Baronet) inherited the Arley Estate. The moat can be seen surrounding the house and vegetables are shown growing to the south west but there is little to indicate the existence of any ornamental gardens. Sir Peter and his wife Lady Elizabeth (Lady Betty) did much to improve the park and gardens. In 1763 they employed the well-known landscape gardener William Emes to improve the park and the surroundings of the house. The database contains several receipted invoices from William Emes. The 1786 map extract shows the work accomplished by Sir Peter and Lady Elizabeth during their period in control of the estate. The moat has been filled in and a 'ha-ha' (a sunken ditch along the line of what is now the Furlong Walk) has been constructed to divide the Garden on the south west side of the house from the Park. New garden walls can be seen in the area which are still in existence today. On the east side of the house an ornamental garden has been constructed in what was then the fashionable informal 'natural' style. Trees and shrubs are planted among irregular shaped beds and wandering paths.